On October the 6th, Dublin Games Festival will present an event that’s never been seen before in Ireland and its free. 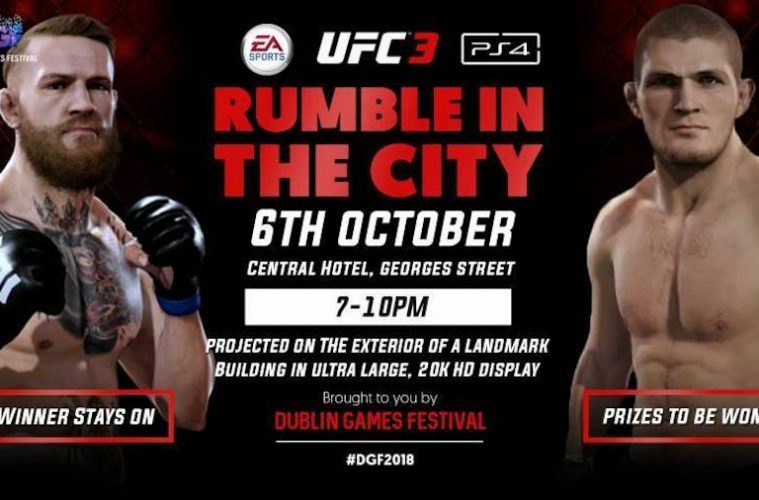 Rumble in the City is an event catering to fans of UFC and gaming in general and with the McGregor v Khabib fight on later in the night what better way to showcase UFC3 not just on a big screen but projected on to the exterior of Dublin Business School from the Central Hotel in 20K Full HD. ‘There has been a tonne of interest in this event and to ensure that we manage everyone’s expectations. We would advise anyone looking to compete to arrive early as we are expecting queues. The room we have holds 20-30 people at any given time and we have it till 10 pm. We should be able to get through a lot of people but as this is a free event to the public we can’t guarantee everyone will so please do come early’. said Graeme Moore (COO).